Meta Tags are one among the most basic components of SEO. It's a must knowledge for every blogger. They been a big part in search engine history. They were valued as an element in search engine rankings before – until people started abusing their use in getting on top of the SERPs. After that, Google opted meta tags out of the ranking factors. However that doesn’t mean they’re not vital anymore. Meta tags still play quite a big role in our Blog’s SEO. Meta tags are the words that are hidden in our post. Readers on our blog can just not be able to see them. The search engines still scan them for it to get a simple, summarized idea of what your web site is about and what precisely your keywords are. Title – The title tag is the title text that's shown in search engine listings. Description – The meta description tag is wherever you'd need to place your site’s summary. This can be wherever you put what your web site is all about and what you're offering people. It shouldn't be too long because the search engines solely scan up to an explicit range of words. A simple meta tags will look like this. The importance of meta tags is that the search engines scan them in order to compare if these keywords and also the description are related with the visible content. are your keywords present in your webpage? Is your meta description related together with your content and your site’s niche? there is factor in our meta tags that the search engines see, that being the reason why meta tags is very important. Open graph meta tags is allow us to control what content shows up when a page is shared on Facebook. We’ve all seen posts like these image below on Facebook. Ever wonder how we can control the content that displays. Well the answer is Open Graph. og:title – The title of your page, content, object etc. as you'd like for it to appear when displayed on Facebook. og:description – maybe the most important tag. this is the 1-2 sentence snippet that shows up within the post. Write this carefully as this will be the factor between getting clicks or not. og:type – the type of content. think about these as categories, hotel, blog, article etc. og:image – the address for a picture you want to represent the your content. pictures should be either PNG, JPEG and GIF formats and a minimum of 50px by 50px. og:url – this may be the address which will be associated with your content ie the link. 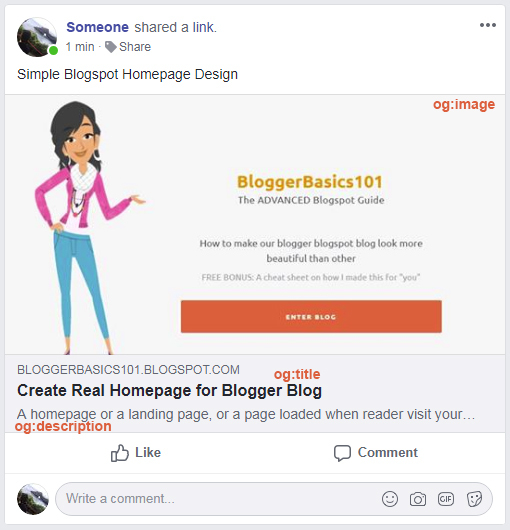 Luckily in our blogger, we can add Opengraph meta automatically, all we have to do is go to Theme > Edit HTML > look for <head> and </head> tag and insert below code somewhere between it, usually after tag <title>. all-head-content is inclusion managed by Blogger Server there is openGraph inclusion inside it. We can test our blog to see how they look when someone share an our post with Facebook Developer Tools Debugger. If there a miss in 'description' at our homepage, you can fill your site description meta in your Blogger Settings > Basic and look for 'Edit' button at Description section.